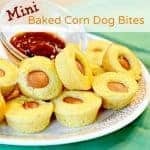 Quick simple and delicious mini baked corn dogs are the perfect easy lunch or dinner for your busy weeknights. My house is a wreck, a complete and utter wreck. We just got back from our drive across the country to visit my family in Kentucky and Indiana, and now it looks like the contents of my car barfed all over the living room and kitchen. On top of all of the travel unpacking, I didn’t have any food in the house so I had to go to the store this morning; what empty space that was left is now filled with bags, boxes, and melons. Oh me, oh my. While I was visiting my mom in Kentucky we both took note of some mini baked corn dogs on the interwebs and decided to make them one day for lunch. They were great. I was surprised how much I liked them considering I don’t love hot dogs. They are a little sweet, a little salty, and just the right size to pop in your mouth. The kids loved them, they were super simple to make, and they were a fun venture from our normal lunch or dinner. We have a fall party most years and I think that I’ll put these on the menu. They’ll go perfectly with a hot bowl of chili and some homemade root beer. 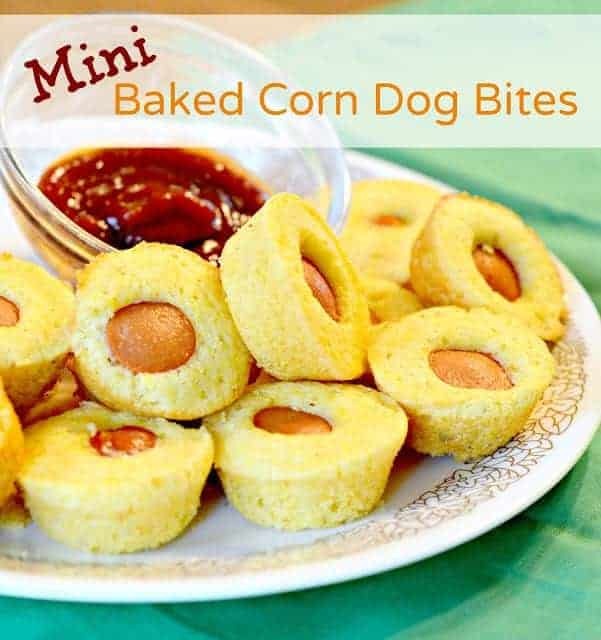 Quick simple and delicious baked mini corn dogs are the perfect easy lunch or dinner for your busy weeknights. Preheat oven to 400 degrees. Grease mini muffin tins and set aside. In a medium bowl add the Jiffy mix, egg, milk, and spices. Whisk until completely combined. Spoon 2 teaspoons of the cornbread batter into each muffin cup and then gently press a piece of hot dog into the middle of each muffin. Bake for 8-10 minutes until the edges are lightly brown and the corn muffin is cooked through. Let the mini corn dogs rest in the pan a few minutes before removing. The Jiffy corn bread mix was surprisingly sweet. I like a sweet and salty combo, so I enjoyed it. If you like your cornbread or corn dogs less sweet then you might want to try a different brand of corn bread mix. Hebrew National are out favorite brand of hot dogs. They have so much flavor! Recipe originally published August 2012 and updated October 2017. These look delicious! I wonder if my little man would try them…so fun! I love Jiffy, it’s all I ever use. And I thought I had commented on these before, but I can’t see my comment. These look fantastic. What a rad idea. Do you think you can freeze these and then reheat in the oven? Can you make this without chili powder?